MSM is the natural form of organic sulfur as found in all living organisms. It is present in low concentrations in body fluids and tissues and needs daily replenishment from nutritional sources. The amount of MSM the body uses and needs to function properly is around one half to one gram per day. MSM is found in fresh food including fruits, vegetables, meat, milk and dairy products, but due to its volatility much of this essential component is lost during food processing, such as heating or drying. Therefore, with the exception of those persons whose food is based mainly on fresh or "life" food, many people do not get sufficient MSM from nutritional sources. It was demonstrated that medical use of sulfur is helpful in many health problems without causing any adverse drug reactions, and numerous food experts worldwide are of the opinion that it contributes effectively to keeping the joints healthy, to provide musculoskeletal pain relief, to stimulate growth processes and to regenerate and stimulate growth of hair, skin and nails. At high doses, MSM works as an effective and safe therapeutic agent in a variety of health problems. It provides musculoskeletal pain relief, improves physiological stress symptoms, including irritable bowel syndrome; treatment of mucous membrane infections; harm reduction after exposure to pesticides and normalization of numerous physiological processes, including more effective absorption of food ingredients and improved appearance of the skin, hair and nails. MSM is a very effective painkiller in musculoskeletal pains such as arthritis and osteoarthritis. Arthritis patients who were given MSM report a significant and long-term relief in pain, stiffness, swelling and osteoarthritis. Sulfur deficiency may be a factor in the development of arthritis. Studies have shown that the sulfur concentration in joint tissue of arthritis patients is about one-third lower than in persons who do not suffer from any problems of the joints. Results of clinical trials in arthritis patients demonstrated a significant improvement of 80% in pain control in the treatment group for 6 weeks after the beginning of the trial, compared to less than 20% improvement in the placebo group. Another study compared two groups of arthritis patients. One group was treated with MSM and the second one with non-steroidal anti-inflammatory drugs (NSAID`s). In the MSM group there were significantly fewer cases of bleeding ulcers - an adverse drug reaction frequently observed in patients taking NSAID`s. Most physical pain originates from the tissues with the highest concentration of nerves. Aspirin successfully switches off the nerves, but does so by damaging muscles and nerves. On the other hand, MSM protects muscles, stimulates the blood circulation, inhibits inflammatory processes, accelerates therapeutic processes and prevents swelling and pain. The therapeutic experience with MSM demonstrates its capacity to relieve musculoskeletal pain typical for athletes and patients suffering from fibromyalgia, CFS (chronic fatigue syndrome) and cancer. MSM is also called "the natural beauty mineral" thanks to its capability to impart a healthy look to skin, hair and nails. Sulfur is a constituent of a protein called keratin, which is present in high concentration in these tissues. In fact it is keratin that makes the nails strong. Taking 2-3 capsules before intensive physical exercise, such as strength training or competitive sport minimizes athletic injuries and muscle load. The body feels completely different after the training. Taking MSM after an injury or muscle strain relieves the pain and causes other symptoms to disappear faster. A combination of MSM and vitamin C has been reported to be even more effective, especially in the treatment of leg muscle cramps among athletes suffering from severe muscle cramp after sporting. Recently a double blind study was conducted on 24 men and women with severe athletic injuries within a period of less than 30 days. The patients were randomized and underwent chiropractic treatment, ultrasound screening and muscle stimulation. The patients in the MSM group reported a 58.3% reduction in injury symptoms compared to 33.3% in the placebo group. In addition there was a significant economical benefit- the patients succeeded in reducing the number of visits to the physician by 40% - to 3.25 visits compared to 5.25 in the placebo group. So many positive physiological effects are attributed to MSM that it is not surprising that it provokes a lot of curiosity among practitioners of alternative medicine. Taking MSM only once or with interruptions is not effective. Significant results are usually obtained after using it for a period of a few days to 21 days. The minimal therapeutic dose is between 750 mg and 1,000 mg twice daily. As mentioned above, MSM is more effective in combination with a daily dose of 1,000 mg to 2,000 mg of vitamin C.
According to the literature MSM is "as safe as pure drinking water". MSM is not allergenic, and does not interfere with drug treatment. Sometimes it is even used as a mild and safe blood diluent, which should be noted when blood diluents such as Coumadin or Ticlidil are administered. There is no risk of overdosing or exceeding the toxicity limit when taking MSM, since the body eliminates any excess amount 12 hours after taking it. Less than 20% of MSM consumers may experience typical detoxification symptoms during the first ten days of use, during which the body secretes and eliminates toxic substances. These symptoms may include frequent stools, skin rash, headaches and a feeling of fatigue during a couple of days. This is basically a positive sign since, generally speaking, the appearance of several symptoms indicates the presence of a high level of toxic substances in the body and effective MSM activity. In case Candida infection or metal toxicity is suspected, it is recommended to gradually increase the dose. 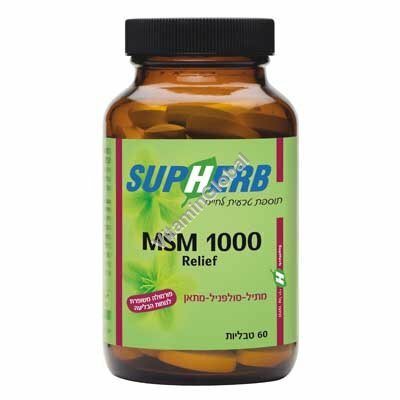 MSM relief series is available in packages of 60 tablets.